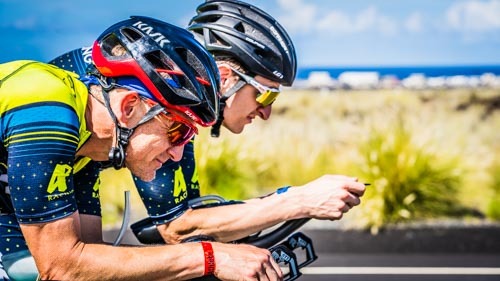 We started AP Racing as a way to help athletes accelerate their learning curve and gain a deeper understanding of themselves by sharing years of experience, trial + error and key learnings from Andy and his coaching staff have. In the following article, we outline the key tenets Andy uses to build his training programs and the methodology we use for our athletes. The first thing that critical to understand is that there are no absolutes. There is no magic formula that works for every person or even for the same person each year. What brings you success one race might not work going forward. We are dynamic in our lives, our training, and even our physiology. So, it is important to gain a deeper understanding of yourself, what responses different training modalities/stimuli aim to achieve, and how to put it altogether. Similar to the above, you are a continuous experiment of 1. Continue to study yourself, try new things and experiment to find different results. don’t know where you have been. are the key pillars of success. Your success is not dependent on one workout, one epic week/weekend of training, or anything in between. Success comes with weeks, months, and years of consistent and deliberate work. A key pillar of our training philosophy revolves around the ‘Golden Triangle’. At each point of the triangle are different elements you can manipulate to gain a variety of results. We look at manipulating one and then seeing what happens(the effect) to the other two. One way to look at it is that on the top of the triangle are ‘inputs’, (run pace isn’t exactly an input but in the absence of measuring run power, it is a good proxy), and the other variables are outputs, or external stressors. your life does not have to fit into triathlon You have a certain amount of ‘stress’, both physical + emotional, in your pie. As you train more(physical), your ‘pie’ can grow, but it still needs to be managed appropriately. As such, we do a lot of ‘block’ training for our AP Racing athletes. We look at training block overloads on weekends/days off from work + combine that with balanced training during other times. As the season progresses, we manage + manipulate these training blocks based on work:rest ratio’s, total duration, and intensity. Check out our simplified approach to how you can think about training in our ‘floors and ceilings article. Now, Let’s take a look at how we at AP Racing put it altogether. GOAL: Establish consistent routine in training, Get body used to consistent movement. Start to develop neuromuscular connections. GOAL: Prepare the body for race day by continuing race specific training with a decrease in total volume so athlete can peak for race day. GOAL: Develop technical efficiency, neuromuscular connections + strength via ‘speed + cadence training’ + shorter duration intervals. GOAL: Develop race specific skills to meet the muscular and aerobic needs on race day. GOAL: Develop aerobic efficiency/engine and muscular endurance for race and training demands. GOAL: You just had a great race, Celebrate and Tell Everyone! Pump up the celebration intensity + volume. Then, get back to ‘Movement’. Don’t Forget Rule #1- ‘it depends’. There are no magic formulas for periodization tables, or set weeks to do any of these things. There are some general guidelines that we have found that work, but understanding yourself, learning about yourself and learning about your athlete(s) is the key to success. There are times we have athletes spend months in each of these phases, sometimes just a week or two.. There are times where we cycle through every phase in one 4 week block. Similarly, every week of training has a variety of stimuli and types of workouts to stress our bodies in different ways. We don’t just ‘hang out’ and train in one phase all the time; that wouldn't work since our body responds to ‘stress’ for adaptation. 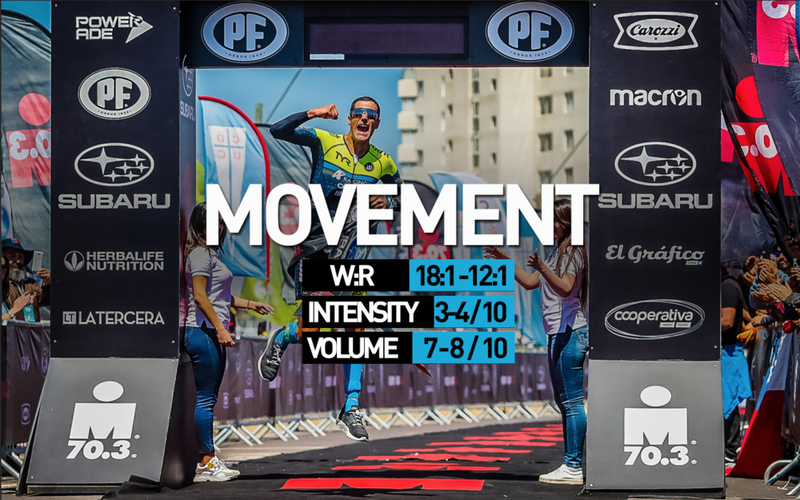 Intensity and Volume #’s: Our Intensity and Volume Factors are based on a 10 point scale, they are not absolute numbers. W:R Ratio’s: Our W:R and Intensity/Volume Factors also fall under rule #1, It Depends. Some athletes respond differently to different ‘stresses’ and we adjust accordingly. In addition, swim training volume typically can be a bit higher throughout all phases of our training since it is a weight supported activity.